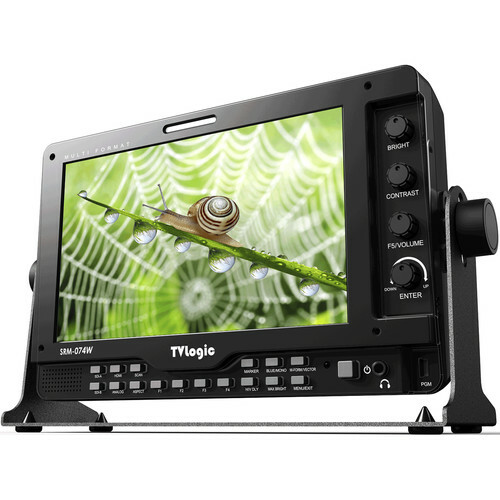 The SRM-074W-N 7" Sunlight-Readable 1024 x 600 HD LCD Monitor from TVLogic features an LED backlit LCD panel housed in a lightweight yet durable magnesium alloy case. Suitable for compact cinema cameras, the monitor offers a wide range of professional features including waveform, vectorscope, built-in HDMI to HD-SDI conversion output, horizontal/vertical image flip, focus assist, audio level meter, and more. The user-selectable temperature adaptive color function measures LCD panel temperature and automatically compensates the white balance drift caused by cold or hot weather.